*Quebec does not contribute to the Discharge Abstract Database. Manitoba data, which were incomplete for earlier years, were included from 2004/2005. Source: CICH graphic created using data adapted from the Canadian Institute of Health Information (CIHI), Discharge Abstract Database. https://www.cihi.ca/en/discharge-abstract-database-metadata – accessed July 14, 2017. 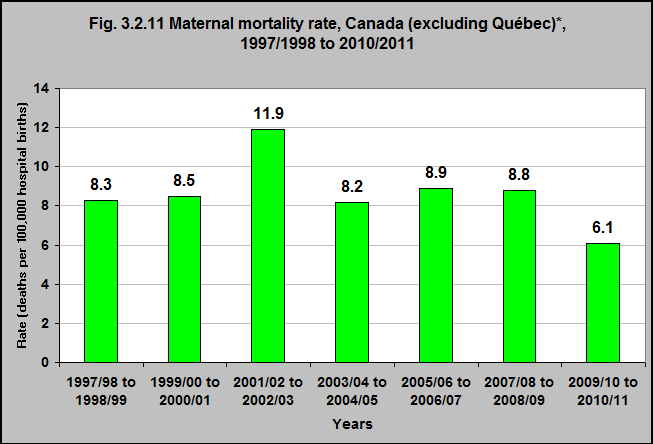 In the years 2009/10 to 2010/11, the maternal mortality rate (deaths per 100,000 hospital births) was 6.1%. This was down from 8.3% for the years 1997/98 to 1998/99. In 1997/98 to 1998/99 it was 42. 1Canadian Institute of Health Information (CIHI), Discharge Abstract Database. https://www.cihi.ca/en/discharge-abstract-database-metadata– accessed July 14, 2017.